A team of professionals, the promise of fabulous loot, the perfect job – what could go wrong? 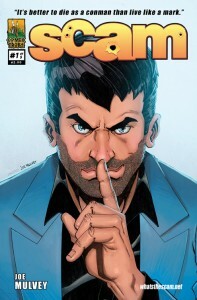 SCAM is the pulse-pounding tale of a crew of super-powered grifters on the biggest con of their lives… taking down a Vegas casino and getting revenge on a former teammate who double-crossed them. SCAM is a five-issue mini-series by writer/artist Joe Mulvey, debuting world-wide in October! Get SCAM from your local comic shop! Find a comic shop near you! RETAILERS: Full PDF Previews of SCAM Available on Request! GET IN ON THE SCAM! Subscribe to the ComixTribe mailing list for SCAM updates, previews, discounts and more! Joe Mulvey is a freelance graphic artist from NYC, trying to spread his love of comics and take over the world one panel at a time. Visit him at joemulveyart.com, or follow him on Twitter @joemulv.